The RCJ6000 is a very high power, state of the art, VIP convoy jammer system, designed for blocking 2 way radio communications. 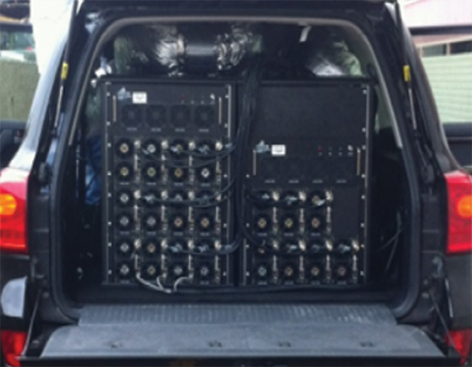 The VIP convoy jammer system provides full jamming capability for the convoy producing a ‘jamming bubble’ engulfing the convoy, protecting the convoy from possible threats like IED’s, GPS guided weaponry and more. The system also prevents perpetrators from conducting any attempt to triangulate the convoy (by VHF/UHF) and it also jams any possible attempt of voice calls/data interception. The system is camouflages and embedded in the VIP convoy vehicles, easy to use and operate while allowing open communications link for the security guards or the VIP. This high end innovative jammer operates between 20 – 520 MHz and its main capability is to block a signal immediately when it is trying to transmit. The system is operated only when a transmission is made, allowing a better usage of the jamming signal. The system is high performance and can block up to 16 UHF/VHF frequencies concurrently. Phantom will provide open cellular communications window for VIP’s upon requirement. Each jamming band is connected to a specially designed antenna such as the “Shark fin” shaped, “Rod” antennas etc. The system use Broadband Omni-Directional antennas for 360º protection. Jamming radius of RCJ6000 depends on several conditions such as transmitter frequency and output power, distance to receiver and obstacles between (meaning physical obstacles like buildings, mountains, other cars etc.). . The RCJ6000 has specially designed software that runs on a ruggedized Tough pad for optimal usage and operation in the field. 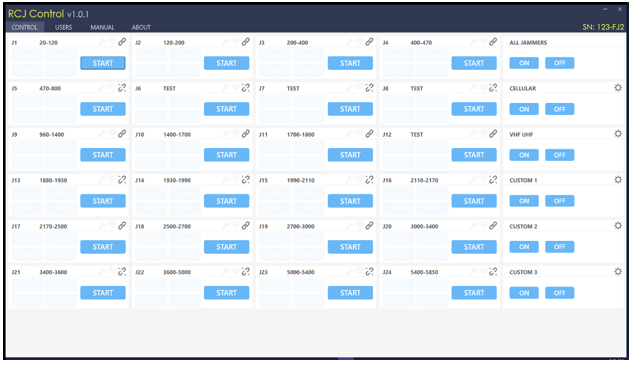 The Below picture shows the GUI of the controlling software as each band can be configured independently.